I made this back in 2000. The photos here are the only ones I still have. With my third solidbody electric cello, I decided to try a more compact design and concentrate more on function than on form. So I went back to the ‘baseball bat’ concept of cello #1, and came out with something like the Village Idiot version of the electric cellos made by Jensen or Ned Steinberger. Instead of mounting the tuning pegs on the headstock like my previous two cellos, I put them at the bottom like on viola #1. I don’t know if that was a good idea or not, but it certainly looks futuristic, doesn’t it? The scooping of the body, to allow for a more-or-less normal-height bridge, was an interesting but irrelevant experiment. Since the cello is suspended and the player doesn’t have to rest it against his/her body, there is no need to shape the instrument to match the physical layout of a standard cello. I probably should have done the whole thing flat, used a lower bridge, and mounted the tuning pegs at the top. Live and learn. The cello is mounted on an assortment of drum hardware I got at Univibe Music in Berkeley, CA (long live Univibe). I had to mix and match pieces to put together something that would serve up the proper angles, but the assembly is reasonably stable and seems to adsorb most extraneous vibration. Instead of dropping big bucks on another transducer, I made my own this time. Actually, I pulled the plastic casing off a Radio Shack piezo transducer (available for about three dollars), and soldered the leads to an audio jack (inside the black box on the back of the instrument). After putting the strings on, I moved the tranducer around to test the tones, and concluded that placing it under the treble-side foot of the bridge (near the A and D strings) gave the most even sound. See viola #1 for more on transducers). 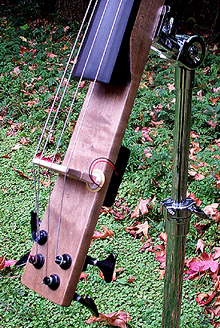 The bridge is a standard cello bridge that I filed down to fit the dimensions of this instrument. It’s a 3/4 bridge, because I couldn’t find a cheap full-size one. The tuners are bass guitar tuners, like on cello #2. The fingerboard is premade, from ebony.